"Meditation, Mindfulness, and Relaxation for Overcoming Chronic Illness"
Having one or more chronic illnesses is extremely stressful. We need tools to help us manage this stress in order to lessen the negative impact on our health and well-being. Since January, I’ve been dealing with downsizing and this process on top of my health issues has been agonizing. This misery compelled me to look for some new coping tools. 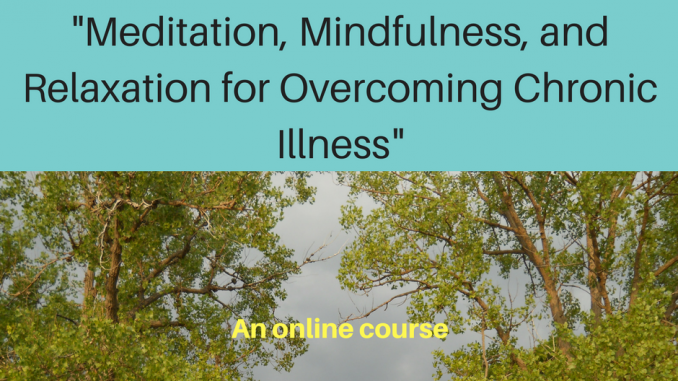 I’m so glad to tell you that I found this wonderful online course that teaches meditation, mindfulness, and relaxation skills specifically for those of us with chronic ailments. Julie Holliday is the teacher in this course and she is wonderful! The course consists of two online sessions per week for 4 weeks. Mine were Monday and Thursday at 1 pm. Each session runs about 40 minutes. Julie provides information on the skill she’s covering that day and then guided practice in each session. The course includes access to a private Facebook page for questions and encouragement and daily recorded practice sessions for the other days of the course. Julie covers relaxation techniques, various breathing methods, and a variety of meditations. I was always leery of meditation, because when I was young I thought the only people using it were drug-using hippies. Meditation was also associated with New Age belief systems and having anything to do with it was discouraged by many in the Christian faith. However, I found Julie’s class to be open to differing beliefs without pressure to focus on anything that we didn’t want to. Since I didn’t have to guard myself against beliefs that weren’t mine, it was easy to focus on the techniques and my tension levels instead. Julie also understands chronic illness herself, since she has chronic fatigue syndrome. She has altered the relaxation techniques to take into consideration that tightening muscles to encourage relaxation doesn’t work with muscles that are in a constant state of tension. Her method is so much more effective!! I experienced real relaxation when doing her classes and practice sessions. This is significant for me, because I realized that my body is usually in a constant state of arousal. Since doing her classes, I’ve been much more aware of this tension and am able to do something about it when I notice it. I worried when I signed up that I was wasting money, but that was not the case with Julie’s course. I would highly recommend that you give her course a try if you struggle with constant tension in your muscles. You can access Julie Holliday’s site here. If you found this review valuable, please share it with friends and family. If you would like to receive these posts plus FREEBIES in your inbox, please sign up below.